A romance set in the high altitude world of the White House, The American President benefits from a stellar cast and a balanced blend of love and politics, although the idealism does get somewhat mawkish. Democratic President Andrew Shepherd (Michael Douglas), a widower, is three years into his first term, eyeing reelection, and riding high in approval ratings. His team includes Chief of Staff A.J. (Martin Sheen) and policy advisor Lewis Rothschild (Michael J. Fox). Shepherd's first priority is the passage of a gun control bill, while an environmental initiative calling for carbon emission reductions is also on the agenda. The Global Defence Council, an environmental lobby group, hires Sydney Ellen Wade (Annette Bening) to lobby the President and Congress and ensure that the carbon emission reduction targets are not watered down. Shepherd is immediately attracted to Wade, and a courtship ensues, sending Washington into a tizzy. While Wade's new cachet helps her to win support for the carbon reduction bill, Republican presidential hopeful Bob Rumson (Richard Dreyfuss) seizes on the President's White House romance to question his character, and starts to mercilessly attack both Shepherd and Wade. The President takes the high road and his popularity starts to plummet, jeopardizing passage of the gun control bill, and forcing Shepherd into some difficult decisions. Written by Aaron Sorkin, The American President is intellectual, romantic, thoughtful and witty. The film is a rarity in targeting an adult audience, avoiding any boorishness, and finding moments of humour without ever descending to childish behaviour. But Sorkin cannot avoid veering into the land of idealistic grand gestures, and when the President's love life finally collides head-on with the realities of his political agenda, the resolution is through the sort of noble policy U-turn, delivered with sombre drama in the White House press room, that can only exist in a screenwriter's head. Sorkin would go on to create television's The West Wing as a quasi spin-off from The American President, television a more appropriate venue to peddle simplistic solutions to complex issues. The more sappy moments of the movie are smoothed over by an excellent cast. 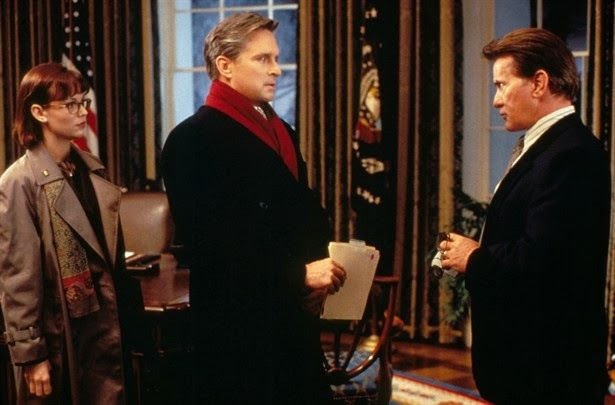 Michael Douglas finds the perfect balance portraying the decisive leader of the free world who is also a living, breathing family man with emotions, reservations, and a need to love. Annette Bening is a perfect match, and she triggers some of the funniest moments as Sydney Ellen suffers severe foot-in-mouth during her first few interactions with the President. Once the romance blossoms, Douglas and Bening make an attractive couple, generating believable warmth and as much comfort as a relationship with the President can afford. Director Rob Reiner provides steady pacing and avoids extremes of emotion or drama, allowing a relatively plausible story to unfold at a relaxed pace. 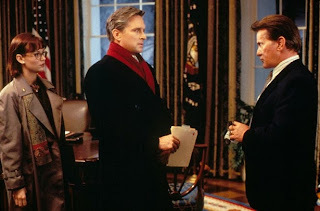 To add colour Reiner calls on an outstanding supporting cast to keep the proceedings lively, with Martin Sheen a steadying influence as the President's long-term friend, confidant, and now Chief of Staff. In contrast, Michael J. Fox is the highly strung, phenomenally smart domestic policy advisor, built and designed to anticipate and worry. Richard Dreyfuss sinks his teeth into the role of the antagonist Senator Rumson, breathing concealed fire while offering nothing of substance in a naked lunge for power. With glamorous Washington DC settings providing an enchanting backdrop, The American President glides to success, perhaps not in a landslide but with a comfortable majority.